Villa Cygnus, is a contemporary 3-bedroom villa located in St. Jean within minutes of the beach and shopping. 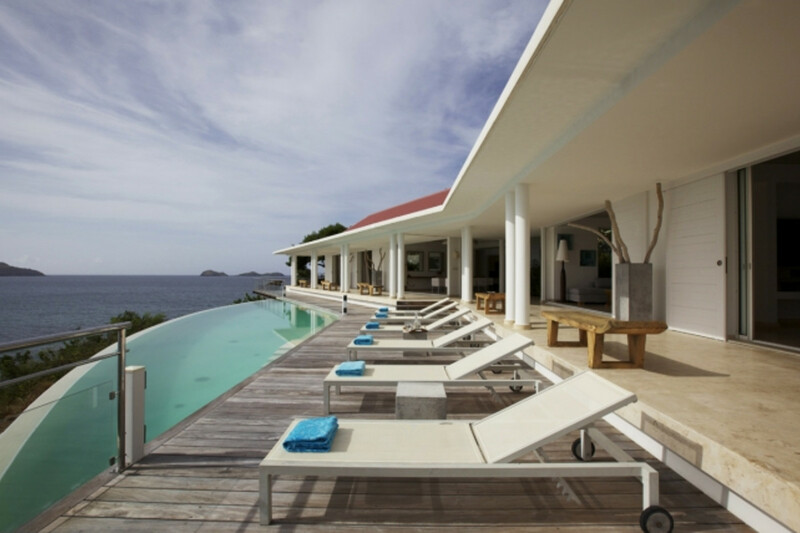 This villa offers a beautiful view of the bay and surrounding islands. The modern interior is decorated with exotic furniture and off-white tones. The living room is large with off-white comfortable sofas, and opens to the heated infinity pool and ocean view. Next to the living room is a large open dining room facing the view. At the back is a modern and well-equipped kitchen with stainless steel appliances. Each air-conditioned bedroom has a king-size bed, en suite bathroom, and opens to the terrace with ocean view. Bedrooms 2 and 3 interconnect. A sundeck with lounge chairs surrounds the infinity swimming pool, making this an ideal spot to sunbathe. The house also has WiFi, a gas grill, outdoor shower, and satellite Dish network. Villa Cygnus comes with house cleaning services six days a week, except on holidays. During the Thanksgiving and December holidays, the villa rents at the full occupancy rate regardless of how many bedrooms are used. This villa is not suitable for children, but welcomes young adults, ages 18 and older. Pets are not allowed. ###Bedroom 01 1 King Bed, Air Conditioning, Ceiling Fan, DVD Player, Ensuite Bathroom, Flat Screen TV, Hair Dryer, In-room Safe Decorated in off-white tones w/exotic wood furniture and facing the ocean. Ensuite bathroom w/double vanity, shower and large dressing area. ###Bedroom 02 1 King Bed, Air Conditioning, Ceiling Fan, DVD Player, Ensuite Bathroom, Flat Screen TV, Hair Dryer, In-room Safe Decorated in off-white tones w/exotic wood furniture and facing the ocean. Ensuite bathroom w/double vanity, shower and large dressing area. ###Bedroom 03 1 King Bed, Air Conditioning, Ceiling Fan, DVD Player, Ensuite Bathroom, Flat Screen TV, Hair Dryer, In-room Safe Decorated in off-white tones w/exotic wood furniture and facing the ocean. Ensuite bathroom w/double vanity, shower and large dressing area. Dining Room Dining room with large wooden table for 8 people. Beautiful ocean views and cool breezes add to the ambience. Perfect for entertaining. Kitchen Blender, Coffee Maker, Dishwasher, Espresso Machine, Gas Stove, Microwave, Toaster Gourmet kitchen that connects with the dining room. Also has separate staff entrance. Living Room Comfortable living area that opens to the large terrace, facing the view with flat screen TV, Dish Network, DVD, CD player and WiFi. Terrace Large terrace that includes a sundeck and 6 lounge chairs.